Howell Mountain Vineyards is a 34 acre property, owned and operated by grower Mike Beatty and his family. A true pioneer and visionary who recognized Howell Mountain’s potential, Mike acquired the property in 1977 that became known as Beatty Ranch and over the years championed Howell Mountain as one of Napa Valley’s premier growing regions. 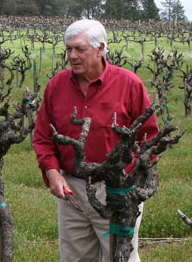 Working with other growers, he helped establish Howell Mountain as an official American Viticultural Area (AVA) in 1983. Howell Mountain lies above the Napa Valley fog line at an altitude of up to 1800 ft and is part of the Mayacamas Mountain Range. It is a unique microclimate, distinct from the valley floor, providing long hours of sunlight and healthy growing conditions. It is dry-farmed on Aiken Loam, volcanic red mountain clay, following sustainable viticultural practices. Home to some of the region’s oldest vines, Mike Beatty’s Howell Mountain Vineyards is planted with equal parts of Zinfandel and Cabernet Sauvignon with small amounts of Cabernet Franc and Petite Verdot for blending. Some of California’s finest winemakers such as James Hall, Ted Lemon and Dave Phinney have made the wine at Howell Mountain Vineyards. Today winemaking is under the direction of Bryn Kane, formerly with Copain, DuMOL and other notable wineries. In 2015, the International Wine Review plans to prepare a comprehensive report on the growers and the wines of Howell Mountain. Howell Mountain Vineyards 2011 Old Vine Zinfandel Howell Mountain ($45) 90+ This is a wine that’s packed with pure flavors, showing dark cherry, red cassis and blueberry fruit with attractive spice notes. It shows more elegance than power, reflecting the coolness of the vintage, and lacks the jammy character found in some warmer vintages. Made from 100 year-old vines planted at the turn of the century. Howell Mountain Vineyards 2011 Petit Verdot Howell Mountain ($65) 91 The 2011 Petit Verdot displays an opaque ruby color and aromas of blackberry fruit and earth. It is soft and lush on the palate with great intensity of flavor. It is full-bodied with lots of texture and mouth feel. The finish is ripe but rather tannic, which is typical of Petit Verdot. Give this wine a couple of years in the bottle to evolve and integrate its rich flavors and other elements. It should give drinking pleasure for seven to ten years. Howell Mountain Vineyards 2011 Cabernet Sauvignon Howell Mountain Howell Mountain ($75) 91 This Cabernet Sauvignon is dark fruited and spicy with flavors of black currants and blackberry. It is concentrated on the palate with earthy notes, round firm tannins, good acidity, and a persistent finish. A beautifully structured wine with bold mountain character. Age it in the bottle for next one-two years and enjoy over the next 8-10 years. This entry was posted in California, Countries and Regions, Red Wine, Uncategorized, Wine Type and tagged Howell Mountain, Mayacamas, Napa Valley. Bookmark the permalink.